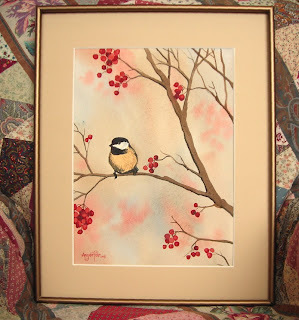 One I'm still happy with..."Chickadee Winter"
In my last post, I declared that my recent streak of unsatisfactory paintings is actually a result of my becoming a better artist. And you wondered, "How can this be? Is Angela Fehr just one of those people who believes there's a ridiculous disconnect between art loved by the critics and art enjoyed by regular people and thinks that by painting bad paintings she can cross over to the snobby side?" My standards have risen. Part of the reason I am unhappy with recent work is because I know more about what good art looks like. I am challenging myself. This is a big one. The fact that I am setting big goals for myself, taking on larger sizes in my paintings, choosing more complex subject matter, means that I have also increased the possibility that I won't complete the painting without error somewhere. And it is true that watercolor is not the most forgiving medium. But I've forgiven it for that. I'm thinking harder. This is a positive and a negative. While planning a painting is a very good idea - it is a smart artist who thinks about composition, perspective, lighting, color scheme, etc. - overthinking a painting can cause it to lose the beauty of flow, "happy accidents" and general looseness that is so desired in watercolor. So...are my recent paintings flops? Definitely. Does this mean I've regressed as an artist? Not at all. I love the fact that I am putting more preparation into my work, that I am comfortable enough with my craft to be a bit more cerebral when it comes to composing a painting. But I'm also realizing just how much I have yet to learn, and trying to figure out how to retain the wisdom of the ages (rules of composition, color, perspective, and so forth), and call it forth when required. It's a bit staggering, actually. Was a lot easier when I just copied my reference photos! All About Watercolor Paper - Quality Matters!